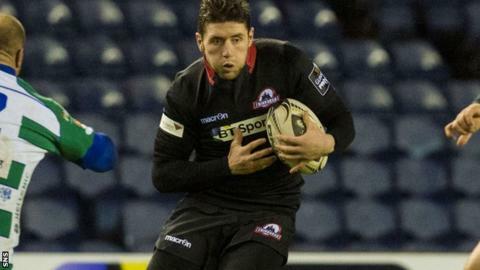 Jack Cuthbert is convinced his Edinburgh side can overturn a 10-point deficit against Glasgow to lift the 1872 Cup. Warriors lead 16-6 from the first leg going into Friday's match at Murrayfield. "The pitch is in great nick and we've bought into more of an expansive brand of rugby in the last few months," said Cuthbert. "So we don't think 10 points is too far out of our grasp at all." Cuthbert expects a physical encounter against their rivals from across the M8, as Edinburgh attempt to halt Glasgow's recent dominance of the fixture. And the 27-year-old revealed a victory would prove particularly sweet for him. "I think that's one of Glasgow's true strengths," he told BBC Scotland. "They like to make a battle of everything if they can, every breakdown becomes a war, every set piece, every aerial collision - you're not given anything against a side like Glasgow. "They really compete across every aspect of the game so we're going to have to mirror that and better that if we want to turn them over and get a result. "It's a 10 point deficit and they're coming to our house on Friday, so it's a massive opportunity for us to put one over them and send them back with their tails between their legs. "Most of my family are based in Glasgow so this goes further than just the shirts, it'll be bragging rights for the year." Edinburgh head coach Alan Solomons is also looking for an improvement from his side against the team that currently sit second in the Pro12 table. But he too believes the Murrayfield men are capable of ending the match clutching the 1872 Cup. "It's a massive challenge that lies ahead of us because 10 points against a quality side is a reasonable margin," he said. "It's not something we can't do but we have to play to the absolute best of our ability. "Firstly we need to put in a good performance that puts us in a position to get the result - and then worry about the rest afterwards. "We've worked on a number of aspects so hopefully we will see an improvement. "It would be an incredible achievement to do that [overturn deficit], we're playing against a side that has the bulk of the national team, that is sitting pretty close to the top of the table, they were last year's finalists and semi-finalists the year before, so it would mean in incredible amount to achieve that."